Mike McGrath grabs a handful of glistening berries dropping from the stainless-steel cowling at the output end of what looks like some futuristic orbital vehicle. “The guys call it cabernet caviar,” McGrath said, dropping the clean, stem-free grapes into the bin below. As winemaker for Conn Creek Winery, McGrath and his crew will spend the coming months painstakingly transforming that “caviar” into renowned Napa Valley cabernet sauvignon. Today, however, most of the winemaker’s attention is focused on the performance of the high-technology machine churning out clean cabernet berries on the Conn Creek crush pad. The device is an optical sorter that, in layman’s terms, is designed to separate the good stuff from the bad stuff. Conn Creek is one of a handful of Napa Valley wineries using optical sorting technology to more closely control the quality and other characteristics of grapes destined to become red wine. While the technology is not new to food processing and other industries, optical sorting has only recently been embraced by luxury winemakers looking for an edge to boost the quality and distinctiveness of their wines. Sorting grapes has long been standard practice among wineries shooting for a high level of quality. Normally, however, sorting is done manually by a crew that picks out trash, stems and substandard berries as the fruit passes by on a conveyor. 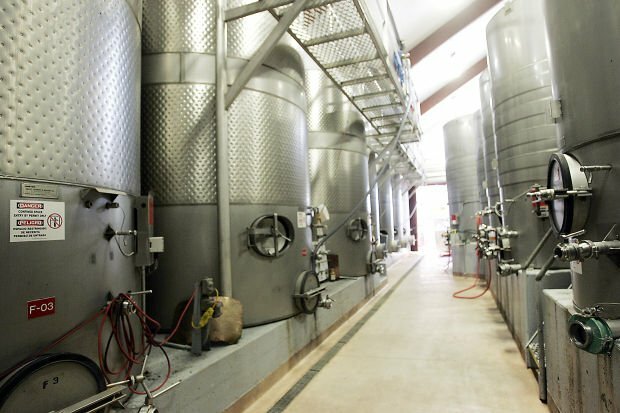 Conn Creek’s optical sorting system is typical of others being used in the Napa Valley and other wine producing regions, Klassen said. Grape bunches first pass through a de-stemmer machine that uses beater bars and other devices to gently coax the individual grape berries from the stems. The berries are then deposited on a shaker table that distributes them evenly as the fruit enters the optical sorter. Inside the sorter, a 10 million-pixel camera scans the fruit, illuminating it with a combination of blue and white light that is adjusted to desired color, shape, size and texture parameters. If it detects an object that does not fit the parameters, an air knife instantly shoots a small burst of air at the offending material, eliminating it from the fruit stream. Klassen said that grapes pass through Conn Creek’s sorter at one meter per second, just over 2 miles per hour. Conn Creek’s optical sorter is manufactured by Switzerland-based Bucher Vaslin, one of two companies marketing the technology to area wineries. 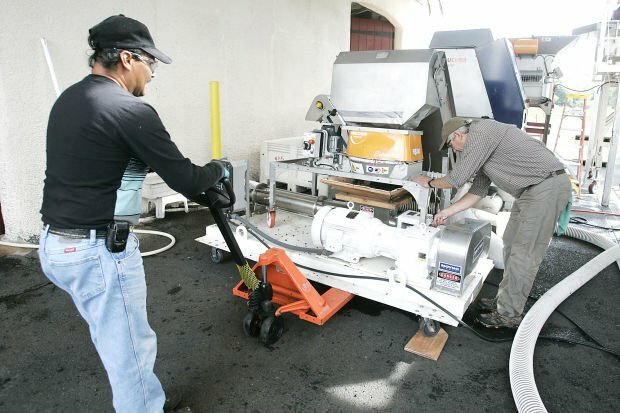 Klassen said there are about a dozen Bucher Vaslin sorters in the Napa Valley and another dozen or so machines made by Pellenc, a French company. Conn Creek’s destemmer is manufactured by Pellenc. Besides the labor-saving efficiency, Klassen and McGrath said, optical sorting enhances their ability to control a number of winemaking variables that affect the ultimate quality and flavor characteristics of wine. The technology is used primarily for red wine production in which the grape’s skin is an important part of the initial fermentation process. In white wine production, skins are generally removed after pressing and only the juice is fermented. Because the entire grape is destined for the fermenting tank, Klassen said, the Conn Creek crew strives to keep the cabernet berries intact during the stemming and sorting stage. After sorting, the winemaker can choose to crush some of the grapes and leave others intact — or whole berry — during initial fermentation. Whole berry fermentation, Klassen said, takes longer but allows various flavor elements to emerge more gradually from the grapes. Taking it a step further, McGrath points out another piece of high-tech equipment on the crush pad, what appears to be a gleaming, open-top washing machine. The device is a centrifuge that McGrath said is used to manipulate the whole berry fruit prior to fermentation. Whole berries are spun through the centrifuge at varying speeds, some breaking apart and others remaining intact. Noting that conventional pressing methods are “a little bit too aggressive,” McGrath said the centrifuge is a gentler and more precise method of performing this partial crush. Conn Creek’s high-tech optical sorter, centrifuge and state-of-the-art destemmer would have seemed otherworldly when the Rutherford winery was founded by Bill and Kathy Collins in 1973. Then, Conn Creek was part of a small but growing group of Napa Valley wineries focusing on Bordeaux-style varietals and guided by the likes of André Tchelistcheff and other early luminaries. Now part of the Ste. Michelle Wine Estates, Conn Creek produces about 35,000 cases annually and remains focused on high-quality, high-end cabernet sauvignon. The winery sources cabernet from vineyards throughout the valley. Its AVA Series wines feature cabernet sauvignon wines sourced from some of Napa Valley’s most renowned sub-appellations and bottled as AVA designates. McGrath said the new technology is part of a strategy to further enhance Conn Creek’s status among Napa Valley cabernet producers.